Archeo Nero d’Avola “Neh-roe DAH-voe-lah” by Ruggero di Tasso is a delightful wine that hails from Sicily. Like the dark-black grapes this wine is named after, they have been blasted by the Southern Mediterranean heat providing the wine with a deep, rich crimson hue. It is a fuller bodied wine with lots of juicy flavor. It tastes of black cherry, raspberry and a teensy-bit of sweet baking spices and chocolate to round it out. The tannins are mild as was the acidity. 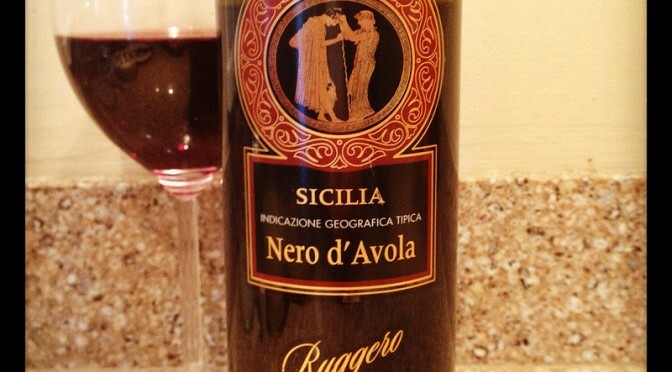 I know lots of folks love Cabernet, Syrah and Zinfandel, but dammit, give Nero d’Avola a chance! As it’s a milder Nero d’Avola, this is the one I’d strongly suggest for the uninitiated. Also, it can hang with all three of those varietals, and I bet you’ll find as good [if not better] a bottle for much less dough. I love me some Cab and steak, so, substitute the Cab with Nero d’Avola, and that’s exactly how I enjoyed a home grilled porterhouse the other night. Great thing is, this wine pairs well with grilled meats, but would also go really well with your Tuesday night frozen pizza. If you’re already making the sojourn to Trader Joe’s (which, if you live near the St. Louis Park location, pack a lunch) to pick up the “Skank Wine of the Month” Primitivo, then grab a bottle of this Archeo Nero d’Avola. Make sure you get the Archeo priced at $4.99, not the Epicuro priced at $5.99! I just don’t care for the taste of the $6 Epicuro Nero d’Avola nearly as much as the $5 Archeo. I just asked a friend to pick up a few more bottles for me because, while my recent vacation was fun, MAN did it kill my vino budget! It’s simply not an option to run short on great, staple wines, now, is it?